Join us for the annual The Take Back the Night March and Rally in the spring semester, where we will unite as individuals who each have an important part to play in responding to violence in our community. 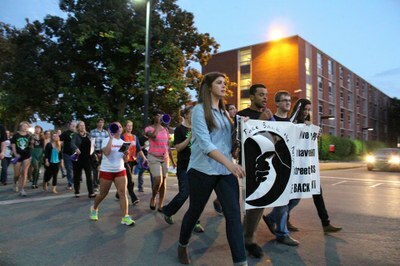 Take Back the Night has been a campus tradition since 2001 and its purpose is to bring together everyone from community organizations, campuses, and neighborhoods to protest sexual and relational violence and honor the stories of those who have been impacted. This inspiring event includes special speakers, a speak out, candlelight vigil and march. There will be a Resource Fair outside the Red Barn and the program begins inside Red Barn, before concluding conclude with a march around campus. Interested in volunteering for Take Back the Night? The most important way students can get involved is by attending Take Back the Night and bringing a pal with them, but we can also really use volunteers at our events. Stop by the PEACC center and take a look at our volunteering wall to see what upcoming events we need help with!